Creating sculpture is like unpacking a treasure chest from deep within myself. It is an interpretation of memories that I have accumulated over the years, from my travels and my experiences. 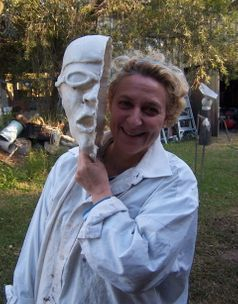 My Italian heritage combined with my African upbringing and life in Australia has had a symbiotic effect on my work. I have found familiar inspirations in all these countries that resonate in natures' organic shapes and forms. The importance of nature in the different countries, has been integral to my work. The diversity of flora and fauna reflect this, for example, with my sculpture "Symbiosis" the message is all about shapes that feed off each other yet nurture each other too. Working with reinforced resin, perspex and stainless steel, my work seeks to develop a 'Chiascuro' effect which enhances the modelled forms and gives them depth, resonant of the Renaissance period. The use of negative and positive spaces fascinates me and creates a particular kind of tension in my sculptures. The colours chosen are a reflection of the Australian and African natural abundance. This reqiures experimentation with finishes particularly for the reinforced resin which is always a challenge to guise.